Steve G. Jones, Ed.D., Clinical Hypnotherapist, charges $1,500 for a custom recording and $25,000 for a one-hour private hypnotherapy session at his office. But you can get all the benefits for this low price. 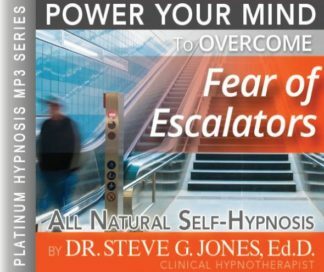 Simply listen to the Fear of Escalators Hypnosis MP3 every night as you go to bed for three weeks and feel the changes happening in your life. You will feel more empowered, more in touch with your true self, and you will truly know that your goals are within your reach. Steve G. Jones achieves AMAZING and LASTING results!!! Hypnosis is the easiest way to affect change in your life because the positive messages go straight to your subconscious mind effortlessly so you can accomplish your goals and reach for the stars!! All you have to do is listen to the Fear of Escalators Hypnosis MP3 download at night as you go to sleep!!! You’ll hear soft music, the gentle sounds of the beach, and the soothing sound of Steve G. Jones’ voice all working together to bring about positive changes in your life easily and naturally. Steve G. Jones has been helping people improve their lives with hypnosis for over 17 years…now it’s time for him to help YOU… don’t wait, do it NOW !!! you’ll be glad you did. See you at the top! And as you continue relaxing deeper, deeper, and more deeply relaxed I would like you to realize just how powerful you are. You are a very powerful, wonderful, amazing, relaxed person. I would like you now to imagine yourself sitting in a movie theater watching a movie. This movie is starring you. Now, you are also in change of this movie. You are in charge of whether the movie continues running or stops running. At any time you can turn around in your seat and wave to the person running the movie up above and behind you back in the projector booth. You can tell him simply by waving to stop running the movie, but for now just continue watching the movie. As I said, the movie is starring you and you watch yourself about to get on an escalator going up. And as you now see yourself get on the escalator notice how relaxed you look. Notice that you are smiling, you are calm. Your breathing is regular, slow and steady. You are still smiling as you are halfway up the escalator. And now you are all the way up the escalator. Notice how easy that was as now you continue watching the movie as you see yourself walk around to the other side of that floor where you will again board the escalator only this time going down returning to the floor where you just came. Now see yourself getting on the escalator, smiling. Perhaps you are talking on a cell phone. Perhaps you are talking with someone next to you while riding the escalator. Perhaps you have shopping bags in your hand. Whatever the situation is you are so relaxed and happy. See yourself in that movie riding the escalator down relaxed, happy, smiling. Now you see yourself arrive at the bottom of the escalator walking around again to ride the escalator up. Now this time I would like you to imagine yourself in the movie. Remember you can stop the movie at any tie you choose. Simply wave to the person at the projection booth. For now I would like for you to see yourself getting onto the escalator in the movie. You are in the movie now, no longer imagining yourself sitting in the movie theater. You are now imagining yourself on the escalator, smiling, happy. Riding up, look down, look how happy everyone is. Notice how happy you are. Look around. You are safe. Elevators are designed by engineers with a lot of education. You are safe. Halfway up now, still smiling, still relaxed, it’s just a movie. All the way up now on the second floor. As you see yourself walking around to the escalator to ride down, remember you are in the movie. You are there. Now, approach the escalator. Put one hand on the railing, which also moves, that’s right. Climb on the escalator. Such a simple smooth process, so relaxing. You are riding down the escalator now, so relaxed, so at ease. You’re there. Look down at your feet. Your feet are standing on a solid step, probably made out of metal. Your hand is on the moving hand rail, also safe. Now you have finished the journey on the escalator. Notice how happy you are. I imagine you are very excited to ride an escalator now in your everyday life, in your real life. You have already had this experience of riding an escalator and you can imagine an escalator as many times as you choose to even now as I am talking or later after this hypnosis session is over. Perhaps you will dream about riding an escalator and it will be a happy dream if you do because you enjoy riding escalators and perhaps tomorrow you will find an opportunity to ride an escalator and you will be surprised at how relaxed you are when you do. each time you listen to this recording you become more comfortable with riding escalators so that very soon indeed you will want to ride the escalator and you will be happy and relaxed while you ride the escalator. Escalators are fun. They are designed by engineers. They are tested over and over. Thousands of people ride every escalator everyday. You will always be safe when riding an escalator. You will always be relaxed. You will always be at ease so relax and realize that everything is going to be just fine. The fear of escalators can create feelings of anxiety and panic. You must realize that your fear of escalators lies in your subconscious mind. You feel fear when you have to get on an escalator because you do not feel as though you are in control. No matter what your fears entail, whether you panic, get anxious, or become fearful that something bad might happen, the Overcome fear of Escalators self-hypnosis session will help you be able to use escalators without fear. Fear and anxiety of escalators is controllable and avoidable. You can get on an escalator and not panic. Hypnotherapy targets your subconscious mind and tells your subconscious mind that you are in control and you have nothing to be anxious about. Your subconscious fear will give way with powerful suggestions on this hypnosis recording and will be replaced with feelings of confidence and calmness in relation to escalators. This self-hypnosis recording will re-program your subconscious mind through visualization. The Fear of Escalators Hypnosis MP3 session is going to have you visualize yourself on an escalator. Visualizing yourself on an escalator is not as stressful as actually being on an escalator. It will train you to control the feelings that you get without actually having to get on an escalator. You will want to prepare your subconscious mind by listening to this Fear of Escalators Hypnosis MP3 recording for 21 nights before going to bed. Twenty-one nights is an appropriate amount of time to get you used to the idea of feeling calm on an escalator. You do not have to live in fear of escalators any longer!